I posted about these crocuses in late January. They have spent the last week buried under a foot of snow but here they are today, a little worse for wear, but here none the less. Does it get any better than this in the garden? Of course it does, but for right now, this is what I have, so I'm making the best of it. 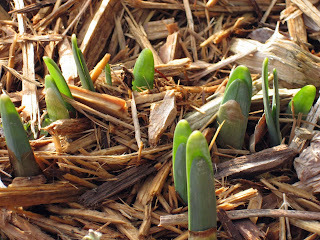 What are you excited to see in your winter garden? 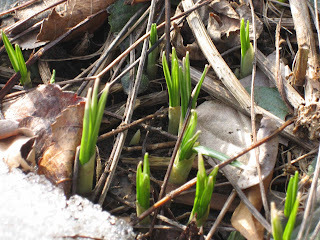 The buds sticking out of the ground are a delight indeed.Gets one to getting the itch so to speak.I have not seen my plots for a few days now I have been gone from before daylight not returning till after dark. It's going to be a loooong time before I even see my ground, much less what's coming up out of it! There is still a three foot drift on the front, (North) side of my house...ugh! Oh man... I have the sedum you posted in that last picture. 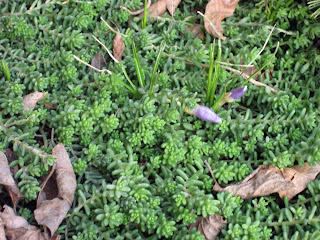 Why didn't I think to tuck little crocuses in among it like you did? That's so cute! My daffs have a head start but it won't be long until they are ready for cutting and arranging indoors - can't wait for the first cut flowers of the year. Hellebores! Yesterday as I was leaving, I noticed my double had started blooming. I will have to get a picture as I wasn't sure it would actually be double (you never know...and last year, it didn't seem to be up to the job)...so, I'm very happy! I will have to go outside and see what's new (trodding carefully around the snow that's still about in some areas)! A bunch of great big hulking chaps to dig a big pond, built me a pergola, a water feature, dig some new flowerbeds, lay a new path and anything else I can think of. 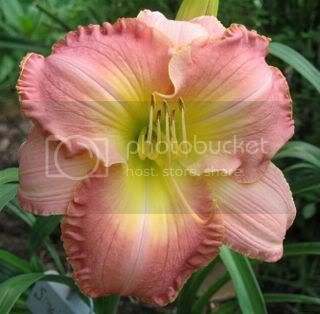 Come to think of it, this is the kind of thing I want to see in my garden regardless what time of the year it is. But for now I settle for snowdrops, crocuses, daffodils, hellebores, bergenia, violets and rosemary.